To many, New Orleans is synonymous with the French Quarter. Most first-time visitors stay in the Vieux Carré and never leave its confines, which is understandable. The Creole cottages, the intricate wrought-iron balustrades, the abundant lust for life — it’s a slice of the Old World. But it can also be dirty and teeming with (often very drunk) tourists. For anyone seeking a more laid-back, local experience, I suggest taking a day trip just 10 minutes away to the Garden District and Uptown. Here the dichotomy of New Orleans is on full display. The streets are littered with potholes, but the homes that line those streets are grand architectural splendors. The best food comes from the swamp but is served on white tablecloths. Vestiges of the past are everywhere you look, but gourmet coffee shops, yoga studios and Whole Foods add a new dimension. As you glide up St. Charles Avenue on a streetcar, ancient moss-strewn live oak trees stretch out their gnarled limbs as if to welcome all comers. And you will feel welcome. As you visit the restaurants and shops, galleries and green spaces, Uptown is an easy place to pretend you’re a local. Strangers will wave from their porches, and passersby will issue hearty hellos. And that’s the real Big Easy. Begin the day with a full breakfast in The Grill Room at the Harper-recommended Windsor Court Hotel, a hidden classic located in the Central Business District between the French Quarter and the Warehouse District. Dishes include local favorites like crawfish, andouille sausage and grits, or more traditional options like smoked salmon and Belgian waffles. Now that you are sated, walk or take a car service 10 blocks to Andrew Higgins Boulevard and Camp Street in the Warehouse District. Adjacent to Lee Circle, this intersection boasts not one but three highly acclaimed museums: The National WWII Museum, the Contemporary Arts Center and the Ogden Museum of Southern Art (925 Camp St.). For the purposes of this daylong itinerary, I recommend visiting the Ogden, the smallest of the three set in a four-story space that has the largest collection of art from the American South. Its broad range includes 19th-century Bayou School landscapes, edgy contemporary installations, early 20th-century photography and vernacular art. Before you leave, stop at the museum store, where you can “shop the South” and purchase exhibition merchandise and locally made jewelry, ceramics and accessories. Walk one block to Lee Circle and catch the St. Charles streetcar (#12) headed toward Carrollton Avenue. (Be sure to have the $1.25 fare in exact change or pre-purchase an unlimited-ride transit pass from the Regional Transit Authority.) Riding the length of St. Charles Avenue, which is what I suggest, takes about 40 minutes, but prepare to hop on and off at your leisure to explore. First stop: The heart of the Garden District, where you can take a self-guided tour of the antebellum homes. As the streetcar crosses Jackson Avenue, prepare to disembark at Third Street (just pull the cable to request a stop). Wend your way around the numbered streets and be sure to seek out Brevard House at 1239 First Street. This 9,000-square-foot Greek Revival, once owned by author Anne Rice, is a fine example of a pre-Civil War home. After touring the neighborhood, you can either get back on the streetcar or go to Commander’s Palace (1403 Washington Ave.), the renowned Brennan-family restaurant, located two blocks from St. Charles Avenue across from Lafayette Cemetery. If you are inclined to have lunch, I recommend the rich sherry-laced turtle soup for which they are known. Get back on the streetcar, making your way farther Uptown while noting the other elegant old homes along the way. Another point of interest along “The Avenue,” as it is locally known, is The Columns (3811 St. Charles), an atmospheric Italianate mansion whose front gallery overlooking the streetcar line is a favorite place to relax with a drink. If you have time for a longer diversion, walk south toward the river to Magazine Street, which is populated by innumerable antique shops, galleries and boutiques. This is also an excellent area to grab a bite to eat. Shaya (4313 Magazine St.) is a James Beard award-winning restaurant known for its wood-fired pita and modern Israeli cuisine. For more of the flavor of New Orleans, Casamento’s (4330 Magazine St.) is a local legend, offering fresh oysters and seafood since 1919. It has irregular hours, so be sure to call ahead. Make your way back to the streetcar for a longer ride to the Tulane/Loyola stop, where you will disembark. Facing west, Loyola University will be on your right and Audubon Park on your left. I highly recommend visiting the Newcomb Art Museum on the Tulane University campus, which is situated next to Loyola. The distinguished Newcomb College was the first “coordinating campus” in the country to award degrees to women. It was predominantly known for its arts program and the highly sought-after — and now very expensive — Newcomb Pottery that came out of it between 1895 and 1940. While the museum occasionally exhibits the pottery, guests can schedule private tours or join public tours of the on-site collection and storage facilities on the first Friday of every month at noon. Alternatively, if you want more of an outdoor experience, cross St. Charles Avenue and walk the 1.8-mile loop around scenic Audubon Park, passing four lagoons and “Bird Island,” where hundreds of egrets and herons nest. If you have a little more time, play a quick round on the beautiful 18-hole, par-62 golf course, or visit the world-class Audubon Zoo, a great place to take the kids. After all this sightseeing, you have two excellent choices for dinner within walking distance. Clancy’s (6100 Annunciation St.) is a white-tablecloth neighborhood restaurant that has become an Uptown institution. Known for its Creole creations like smoked soft-shell crab, lamb chops in horseradish butter, and sweetbreads, it consistently makes the best-of lists, including the 2018 Best Restaurants in New Orleans list by Times-Picayune food critic Brett Anderson. Just like the French Quarter’s Galatoire’s, the tuxedoed waitstaff make a career of working here, and regulars come back weekly. One block away is Patois (6708 Laurel St.), a kind of Clancy’s-in-the-making. Situated in a renovated two-level former corner bar, it opened in 2007 as a passion project for two local brothers and a chef-friend who had worked at Susan Spicer’s Bayona. 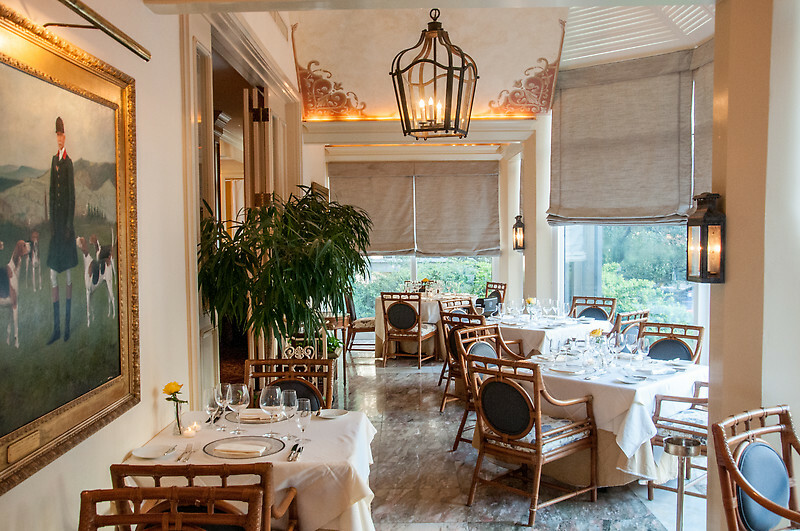 Today it is a relaxed but accomplished restaurant known for serving French-American fare like crab-and-shrimp capellini in chile butter, or smoked crispy quail. Just seven blocks from Clancy’s is the “refined but festive” Dos Jefes Cigar Bar (5535 Tchoupitoulas St.). Stop at this intimate spot for a nightcap, a cigar and jazz, beginning at 9 p.m. weekdays and 10 p.m. weekends. Cigar Aficionado has called it a “must visit on your next trip to the Big Easy.” It’s the perfect place to unwind after a perfect day in New Orleans.